We have compiled an extensive collection of articles on American-German issues, all in PDF format. By clicking the title you start downloading the article. At the end, you find a bibliography of works. Interview with the “Godfather” of intercultural comparative research, done for the SIETAR Europa newsletter. Article about the interplay of language, perception and thought. Appeared in the newspaper Vienna Review, December 2010 as well as the SIETAR Journal, December 2010. A short essay on why Barack Obama is called “no drama Obama”. First published in the Vienna Review, May 2010 and then in the SIETAR Europa newsletter, June 2010. Interview about British and American communication styles. Cover story for the magazine Business Spotlight, January, 2010. The two business cultures appear to be similar. But underneath the surface, there are many subtle and hidden differences. 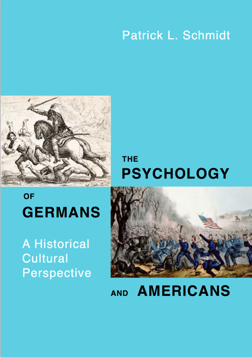 An overview of the historical events that have shaped the German and American mindsets. Intercultural advice for those wanting to do business in Germany. An analysis of how Americans and German communicate differently. Intercultural experiences of American students during their three month stay in Cologne. First published in the SIETAR Europa newsletter in September, 2009. Lecture (in German) on intercultural competence given at Markel Stiftung of Bosch GmbH. Historical reasons why Americans go to court so often. How the forces of globalization are changing Germany (written in January 2003). Description of the interculturally competent person. A reliable and valid measure of intercultural competence. Talk given at the SIETAR Congress in Granada, Spain, October, 2008. German “objectivity” on the work place and its historical origins. How Europeans and Americans perceive each other. Speech on American openness contrasting with German objectivity, given at the Goethe Institute in Chicago. Historical reasons why Americans appear “open and superficial” to foreigners. Intercultural advice for those planning to do business in the United Kingdom. Intercultural advice for those planning to do business in France. Intercultural advice for those planning to do business in Canada. A humorous essay on the difficulties foreigners have when learning English. A modern interpretation of Mark Twain's essay “The Awful German Language”. An amusing article on how German is becoming more like “English”. The expatriate life style in southeast Asia. Test your knowledge and skills with this intercultural quiz. Published in the 2007 Yearbook of the American Chamber of Commerce in Germany. A speech on communication patterns given in Sofia, Bulgaria at the 2007 SIETAR conference. A look at the historical and cultural factors that have shaped the Austrian way of communicating. Published in the “Vienna Review”, November 2007. A short essay on the characteristics of the interculturally competent person. Published in the “Vienna Review”, May 2008. 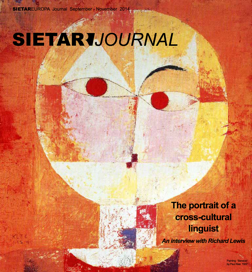 Interview with one of the most innovative thinkers in the intercultural field, done for the SIETAR Europa Journal. An analysis of the German mindset that perhaps explain their extraordinary export success. Interview with the one of the most influential interculturalists of our day, done for the SIETAR Europa Journal. A fading childhood dream of a Franco-German experience. 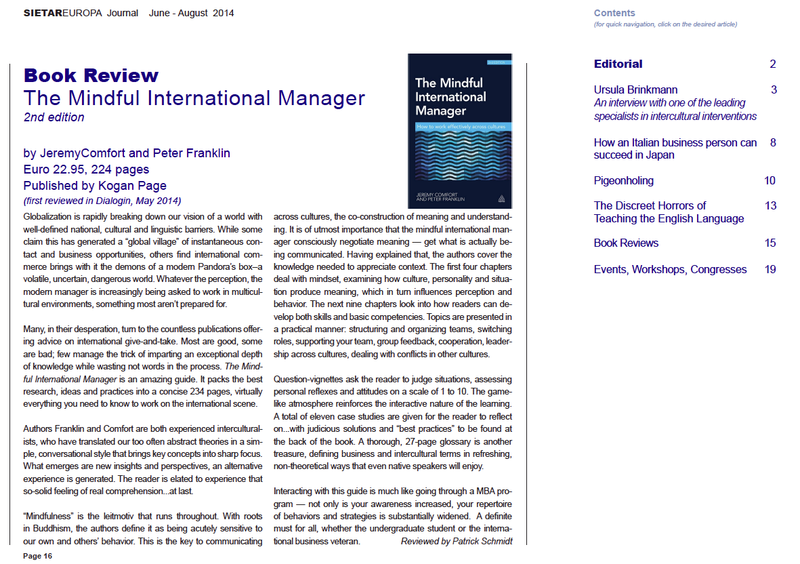 Interview with one the one of the leading management thinkers in our day, done for the SIETAR Europa Journal, June 2012. A summary of Sylvia Schroll-Machl’s famous study on how Americans and Germans interact when working together. Recent research demonstrates that bilingualism affects the brain in many positive ways. Why this book is a must read for all professional interculturalists. A book review about an amazing guide on the international give-and-take. A summary of what empathy really means in the intercultural field, published in the SIETAR Europa Journal. Speech given at the SIETAR Europa Congress in Valencia, May 2015. Speech given in German at the SIETAR Deutschland Forum in Bonn, February 2016. 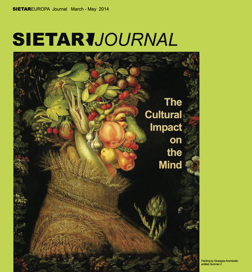 You can view and read the many issues of the SIETAR Europa Journal that I have edited at this link. An interview of Patrick Schmidt (Trade Magazine, German-American Chamber of Commerce, June, 2001). About Patrick Schmidt’s book “Die amerikanische und deutsche Wirtschaftskultur im Vergleich” (Trade Magazine, German-American Chamber of Commerce, June, 2001). Analysis of the unconscious desires of Americans (New York Times, January, 2003). The trap of similarity in German-American relationships (VDF Aktuell, August 2001). About German’s poor showing in education (International Herald Tribune, February 2003). Two Germans write in the FAZ their feelings about being German. Linguistic differences between Americans and British. A United Nations report that shows Americans work the most hours (New York Times, September, 2001). A humorous essay on the American character, written by H. L. Mencken in 1927. Heinrich von Pierer talks to the Wall Street Journal (February, 2001). Survey on how German companies are perceived by American investors (German American Chamber of Commerce, 2001). Interview with one of America’s top German expert on the mindset of a German negotiator (Der Spiegel, February 2003). Some interesting insights on doing business in Germany. A German journalist analyses the important role that U.S. Congress plays in trade policy. Article from the Wall Street Journal about Siemens’ policies concerning its U.S. Operations. The despair and malaise of Germany in the year 2004 as experienced by a reporter of the New York Times (March, 2004). A fascinating intercultural study on how not to enter a foreign market. From the University of Bremen (March, 2003). Article about the many difficulties, including intercultural, WalMart has in Germany. (Der Spiegel, 01.11.2004). Article in German from Der Spiegel on how Germany has become attractive for U.S. investors again. According to a new poll, the image of “modern Germany” is positive again the in the USA (Der Spiegel, October, 2008). An article from BBC News on how Germans and British perceive proper manners.